Baby’s Tear Plant – A houseplant with soft foliage. A low growing plant used in pots, hanging baskets and terrariums, the Baby’s Tear plant is Soleirolii soleirolia and also known as Helixine. 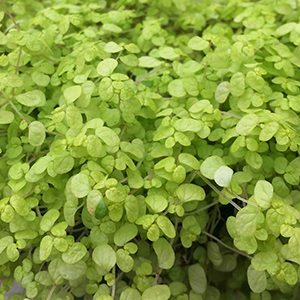 This is a plant that thrives in a moist environment, small rounded green foliage is the main attraction, although a variety with golden green foliage is also available. The growth habit is naturally low and creeping, given space and time it will fill a container or hanging basket and then gently cascade down over the sides. It does make a good ground cover plant for taller ferns in hanging baskets. Although this is a flowering plant, it is grown for the foliage, the flowers themselves are small and insignificant. Another very similar plant, Pilea depressa is also called the same common name. This is a little easier to grow indoors and is worth looking for if you have trouble with Helxine soleirolii. Moisture, high humidity and good air circulation are the keys to keeping you Baby’Tear plant growing happily. It will also require a humus rich moist growing medium. Propagation is easy as the plant naturally sends out runners which put down roots. So division of established clumps is an effective method. Although good moisture is required, this is not a plant that tolerates soggy soils, so good drainage is also essential. A little fertiliser once a month using a liquid seaweed type fertiliser is adequate in most good soils. You can easily prune the plant back to size at any time as required. When you trim back excess growth, dispose of the cuttings thoughtfully, they can take root very easily. If the foliage of your Baby’s Tear plant is turning brown the problem could well be over watering. Over watering leads to the foliage turning brown, however it is the the roots that are beginning to rot that is the real problem. You can try stopping watering, or even replanting the plant in a free draining potting mix. 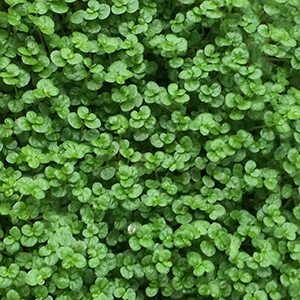 It is a creeping ground cover plant that is more widely used in hanging baskets and in pots than in the garden. The main reason for this is that is good conditions it can become a little to vigorous and invasive. Common Names – Baby’s Tears, Helixine. Position – Part shade is best. Spread – This is a plant that will spread by underground runners, so spread will depend on location and soil. Foliage – Small green and rounded.